People are always thinking of new and exciting ways to support important causes. Long before the ALS Ice Bucket Challenge became a worldwide phenomenon, however, Jordon Milroy was raising disability awareness in his own way. Jordon, who is 24 years old and has cerebral palsy, grew up in Samoa, an island nation in the South Pacific, and currently lives in Auckland, New Zealand. 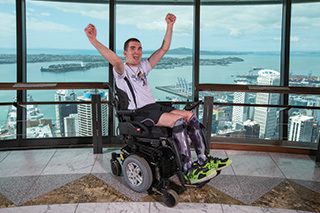 Jordon retains some mobility, and years ago, he succeeded in completing a tremendous physical challenge: climbing every step of the Auckland Sky Tower and bungee jumping from the top. "It all started as a thought at 3 a.m. one night back in 2011," Jordon said. "I wanted to do something to show society that anyone with any ability can set goals for themselves and conquer them." Jordon uses a Q6 Edge® Power Chair from Quantum Rehab®, which lets him travel to and from each climb site with ease. 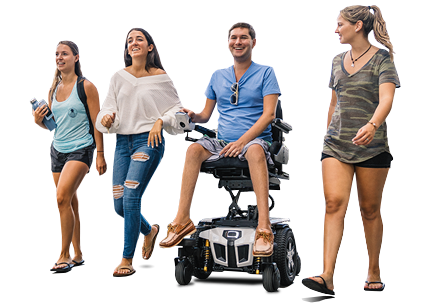 "The Q6 Edge gives me the independence I need and allows me to live the life I want," Jordon said. "I don't like being fussed over, so being able to catch public transportation like everyone else is a huge factor in my life." Jordon also likes the smooth ride that the Edge provides and says he can count on it in any situation. "I've pushed this chair to its limits and beyond," Jordon said. "With the Edge, I know I'll always get where I need to go." Since climbing the Auckland Sky Tower, Jordon has climbed the stairs of a number of other buildings, including the Eureka Tower in Melbourne, Australia, and the Sydney Tower Eye in Sydney, Australia. Each climb gives Jordon an opportunity to challenge himself, but he is also able to raise disability awareness and promote a good cause. "Many of my climbs raise money for rugged wheelchairs for disabled children on my home island of Samoa," Jordon said. "In addition, they show the world what people with various abilities are capable of." Jordon has fully devoted himself to his cause, which he calls Jordon's Climb for Awareness. He gets his inspiration from the people who support him, including his family. "The people around me have spent years helping me get where I am today," Jordon said. "My mother and sister mean the world to me. I think am fully loved for who I am and what I do." Jordon's greatest ambition is to climb the Burj Khalifa in Dubai, United Arab Emirates, which is the tallest building in the world. He hopes to continue inspiring people as he works toward that goal. "I hope that my journey has empowered others to get up and live life," Jordon said. "On the edge!"